FILE - Voting booths are lined up in Albuquerque, New Mexico, Oct. 26, 2012. When voters head to the polls November 8, 17 of America's 50 states will have voting restrictions in place for the first time in a presidential election. Since the 2010 midterm election, a total of 22 states passed new voting laws. "What we are seeing is a pattern emerging across the country that will make it harder for people to access the ballot box," said Kristen Clarke, executive director of the Lawyers' Committee for Civil Rights Under Law. Other new state voting laws were passed after a 2013 U.S. Supreme Court decision effectively eliminated a key part of the Voting Rights Act. The high court ruling eliminated the need for states with a history of voter discrimination to get federal approval prior to changing voting laws that impact minorities. The new laws come at a time when the U.S. ranks near the bottom in voter turnout compared to its peers in developed democratic nations. The U.S. ranked 31st among the 34 countries in the Organization for Economic Cooperation and Development, according to a study done in 2015 by the Pew Research Center. States with new voting laws have taken a variety of approaches to regulating the voting process. In addition to adopting laws that require voters to present a photo identification and other types of IDs, Clarke said some states have eliminated or reduced early voting opportunities, removed same-day registration programs, terminated pre-registration for 16- and 17-year-olds, and even purged registration rolls, resulting in the removal of eligible voters. 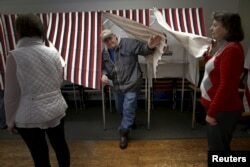 FILE - A voter exits a voting booth after filling out his ballot in the U.S. presidential primary election in the village of Groveton, New Hampshire, Feb. 9, 2016. The laws make it more difficult to "exercise the fundamental right to vote," Clarke said, and "have the effect of suppressing voter turnout and participation," particularly among African-American, Latino and poor people. In the U.S., about 11 percent of Americans do not have a government photo ID, according to New York University School of Law's Brennan Center for Justice. A study conducted recently by the University of California at San Diego found significant declines in minority voter turnout in 2008 and 2012 in states with strict voter ID laws. In Texas, which has what is considered the most stringent voter ID law in the U.S., more than 608,000 registered voters do not have the types of IDs required by the law, a federal court has found. The Texas law has already been struck down by three courts, which determined it discriminates against African-American, Latino and poor voters, who are less likely to have IDs required by state law. Nevertheless, the Court of Appeals for the 5th Circuit in the city of New Orleans held hearings Tuesday on the legality of the Texas law. The court left the law intact, but the Supreme Court expects the lower court to decide by July whether the law should remain on the books. The new voting laws are necessary, according to the Heritage Foundation. On its website, the conservative think tank said, "The United States has a long and unfortunate history of election fraud" and "preventing, deterring and prosecuting such fraud is essential to protecting the integrity of our voting process." In addition to Texas, voter ID laws are being litigated in North Carolina, Virginia and Wisconsin, all of which were swing states in the 2012 general election, which Democrat Barack Obama won over Republican Mitt Romney. Barring appeals, the new voting laws will be in effect for the November presidential election, when the ramifications of any judicial rulings could be significant.